Coming soon... can you guess it? I've got a very big post coming up on another building with a rich history. I did most of the preliminary research a couple months ago, and I'm finally getting around to preparing the post. This afternoon, there was a fire on Bronson which caused traffic to be redirected onto surrounding streets. (Traffic was pretty constant on Gladstone) I got a tip about the fire when I was on the other end of Centretown, and made my way over on my way home. By that time, Bronson was re-opened and there was only one fire truck and a fire investigator's minivan. Firefighters were tidying up the hoses that were going into the house. The building housed the offices of family physician Dr. Tung Le, and the front door showed signs that the firefighters had to break into the house, suggesting that nobody was inside at the time. (The Ottawa Sun reports that nobody was injured.) Many of the windows were also knocked out from the inside. It looks like the fire was relatively contained and that the building will survive. 160 Elgin, a.k.a. Place Bell, renovated their entrance earlier this decade, to be a bit more inviting to pedestrians. Earlier this month, they were adding some decorations for the holidays. Unfortunately, the giant wreathlike "160" is obscured by the flaring lower canopy. Coming from the West, the sidewalk just withers away gradually (photo cropped, taken mid-October 2009). The City was considering extending the enclosure all the way to the edge to further discourage pedestrian passage. Luckily, this inexpensive bollard-and-asphalt arrangement was chosen instead, and pedestrians can once more safely pass through this stretch of Somerset. Since this photo was taken, little plastic posts were installed to help delineate the new sidewalk for motorists, snow-clearing crews, and visually-impaired pedestrians alike. Central Phase II - what do you think? 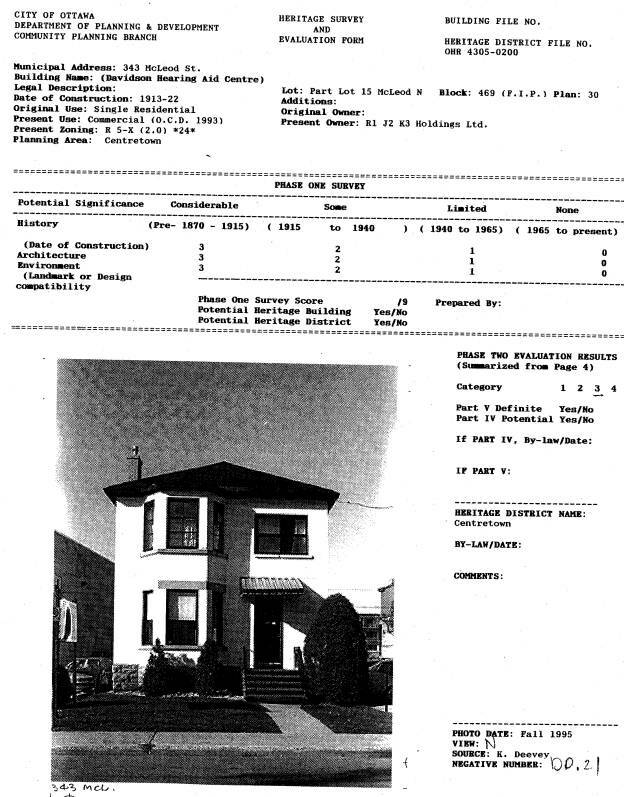 Buried at the end of the previous post, I mentioned that Councillor Holmes orgnized a public meeting at Centretown United Church for the builders of the Central condominiums to share their plans to build a second building at Bank and McLeod. Here's a panoramic view of the area on Bank Street, looking East (click to enlarge). On the left is the Metropolitan Bible Church, under disassembly/demolition, then McLeod Street, then the Medical Building at 340 McLeod with large parking lot at Bank, then the CLV building (whose tenants include Vistek, where I got this new camera), the tower of Centretown United, and finally Bank Street. This is across the street from Tommy & Lefebvre's flagship store, under reconstruction after the fire this past March. Below is a rendering of roughly how this same view might look. On the left is the Central Phase I (permits already approved, construction underway) with the Metropolitan Bible Church's façade retained. In the middle, across McLeod Street, would be Central Phase II, separated from the CLV building by the CLV building's parking lot. Thanks to Natalie at FoTenn for getting me a electronic copies of the panels from Tuesday's presentation. The graphics were prepared by Core Architects, the Toronto-based firm whose Ottawa developments include the East Market building, the Mondrian, and of course the Central Phase I. Note that the renderings are all preliminary, and no applications have been submitted to the City at this point. Here's the site as it sits today at Bank and McLeod. That brown building with the tall windows is the Medical building, and it has sat vacant for eight years. Along the Bank Street frontage is a large parking lot, all part of the same parcel as the Medical building. David Wex of the development company said they purchased the site a month or so ago, with some final paperwork left. Note the bike cutout on McLeod at Bank, so cyclists can go straight or turn left from McLeod, but motorists must turn right. This will likely be retained. 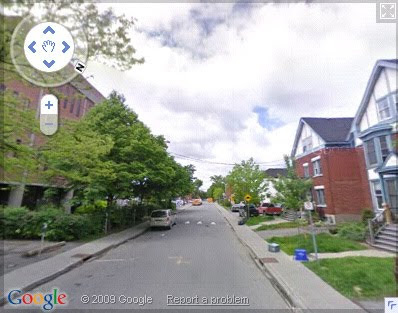 Here's a view of the site and zoning from the City of Ottawa's eMap application. You can see that the medical building and the parking lot are all the same property, and the way the parking lots fit together like a jigsaw. The eMaps property report shows that the zoning is TM H(19) - Traditional Mainstreet, maximum 6 floors, maximum height 19m, with a Heritage Overlay. 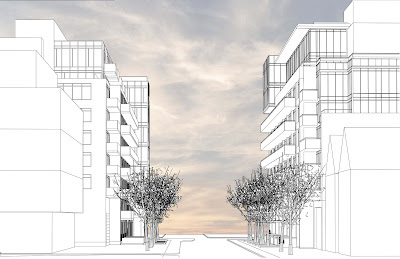 The developers will be asking for variances for an additional two storeys, plus a reduction in setback requirements along Bank. And here's an aerial rendering from Core Architects of what the two buildings are proposed to look like on the site. We're looking West, with Phase I on the right, and Phase II on the left, with the Medical building in front of it. Here's another rendering of the street view looking West along McLeod toward Bank. The Medical building holds up better to the mass of Phase II than the houses on McLeod do to Phase I. Now, it's hard to make it out in this flat elevation, but we're looking at the building from the South, with Bank Street on the left and 340 McLeod on the right. The bottom of the "L" is at the left in red brick, and the rest of the building is further back. 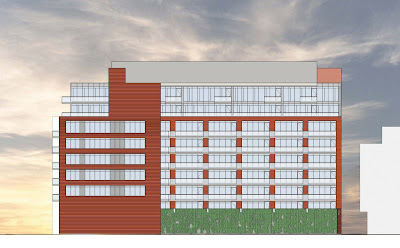 In the spirit of the LEED design principles, the developers are planning to build a Green Wall along the single-storey wall abutting the CLV parking lot. Above this first storey will be a landscaped courtyard for the residents. On the ground floor of the building, they've got some interesting proposals going on, as shown in the rendering below. The greyish area represents ground-floor retail. They're suggesting the possibility of an urban-format grocery store in that space. 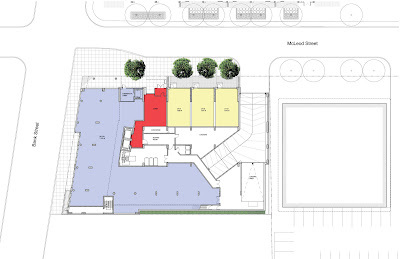 The red bit is the lobby, and the yellow squares are "loft-houses," essentially two-storey townhouses at the base of the condo tower with entrances on McLeod. At the back of the site (inside the building) is the entrance to the two-level parking garage, which will have room for residents and visitors (retail parking for both phases will be provided in the Phase I building, which has only sold 70-80 parking spots of the 138 allocated to residences, leaving many available to add to the 40 spots already reserved for public parking). Lastly, a loading dock at the south-east corner of the building interior will share the same set of doors as the garage. 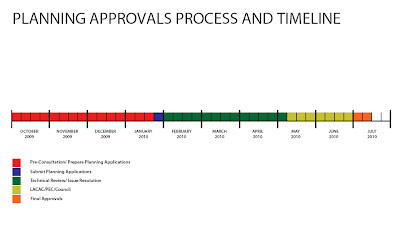 The timeline for the applications process was described on this panel. We're currently in the 'pre-consultations' phase, and the developers expect to submit their applications around the end of January 2010. This is when the formal public process will begin. At the meeting, Councillor Holmes suggested that residents should wait for the applications to be submitted before sending comments to the City, but I am of the opinion that it's never too early. There was a wide variety of opinions expressed by those in attendance at the meeting on Tuesday. Some neighbours to the site were worried about the building being two stories higher than what the zoning allowed. A couple of people who recently bought houses in the area enthusiastically welcomed the increase to their property's values, "so keep going," they said. Other concerns included the loss of parking and whether the green wall would get enough light to survive, or if it instead would become an alley attracting graffiti. The proponents said that the pair of developments would create an "European feel" with a consistent building form across multiple streets. Lastly, here's the latest view of the Metropolitan Bible Church. They've finished dismantling the top of the Façade and have removed the scaffolding. For the uninitiated, the Metropolitan Bible Church is a former church on Bank Street between Gladstone and McLeod. It was built as the Metropolitan Tabernacle from 1934-1936, and is in the Centretown Heritage Conservation District. The congregation moved to new digs on Prince of Wales Drive a couple years ago, leaving the building vacant. It was used as the returning office for Ottawa Centre in the 2008 general election. In this shot you can see all the way to the rear of the building, plus the demo suite at the corner. There's a parking lot behind the building (unpictured) running the width of Gladstone to McLeod, and is twice as deep from Bank as the rear of the building. The tiles on the underside of the awning were removed, revealing its construction. Mostly wood. In 1967, this annex was added to the South side of the building, running along Bank to bring the building all the way to McLeod. It's less decorated than the façade of the main building (ironic, given the relative economic conditions of each time), but the semicircular decorations above the second storey windows give the annex just a hint of character. At the rear of the building, amidst a lot of parking spaces, sits 343 McLeod, a white-painted house formerly home to Davidson Hearing Centre. 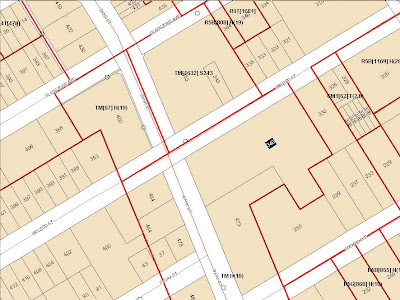 The heritage survey and evaluation form, created in 1996 as part of the Centretown Heritage Conservation District study, estimates the date of construction at around 1913-1922. The houses in the background will be spared its fate, but will have to contend with seven storeys of condo wall immediately adjacent. By mid-October, the hydro connection (visible in the above photo) had been cut, but there were still blinds in the windows, which would presumably be removed before demolishing the house. The Central is, after all, destined for LEED certification. The house was one of the first things to go, in late November. In this shot (actually a night shot taken with long exposure), you can see that 343 McLeod was in fact a red-brick house, like so much of Centretown. At the front of the building, a large green banner had been added to advertise the condos, and was starting to fall apart when they removed the awning (for safe keeping during construction) in November 2009. Scaffolding was installed on the façade (the entirety of which can be captured in one frame with my new camera), and this scaffolding was covered with green mesh to minimize dust and debris falling to the ground. A couple of the workers poked their heads out to have a look. The scaffolding is for the protection of the façade. As approved in September, the façade will be integrated into the new building, but first it will be disassembled brick-by-brick to the roofline, then the rest of it will be secured against a metal frame. The frame and façade will be moved aside, and the new foundation will be built. The façade will be replaced, and the top bit rebuilt brick-by-brick. This engineer's report (PDF) explains the process, the different options, and also shows some close-up images of the architectural details. Moving along to the 1967 addition, demolition of it began in mid-November, with careful debricking of the rear wall, as mentioned at the time in the Bucket Feet post. On the inside, even an institutional building is generic enough to be familiar. It's always jarring for the insides to be visible from the outside, exposed for all to see like a cut-away diagram. Here's the de-bricked rear wall of the annex, with the window cap decorations still in place. I presume they saved the bricks for re-use with the finished product. Note also the hole punched into the main building, at the far right of this shot. In the foreground is one of the window caps laying on the ground. Like the awning, it too was made of wood, and faced with plaster. The implements of demolition, foreground and background. A couple more days and a few more rooms chewed away. The surprise is starting to reveal. Do you see it? Here it is, a remnant of a painted sign on the wall. You can also make out the shadow of the rest of it. It read "Metropolitan Tabernacle". The blog Vanished Ottawa collects photos of these old painted signs. Surprise number two has to do with the site next door. It seems that the company that is building the Central has bought the site next door at Bank and McLeod (directly across from Tommy & Lefebvre), including the medical building. More condos are apparently on their way. 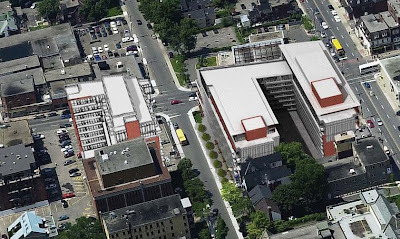 Councillor Holmes has organized a public information meeting on this new develompent on Tuesday, December 8th, 2009 at 5:30 pm at Centretown United Church (Bank & Argyle, basement), and the developer will be on hand to present plans and concept drawings. According to Councillor Holmes' release, a mixed-use project with retail at grade and residential units above is being proposed. Not unlike the Central condominiums, whose ground-floor retail will apparently consist of yet another Shoppers Drug Mart.